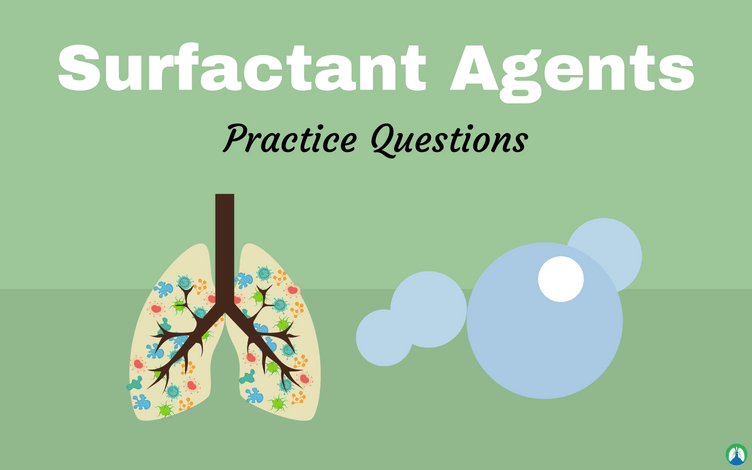 As a Respiratory Therapy student, you will be required to know all about surfactant, what it does, and how it affects the lungs when there is a lack of surfactant. To help with that, we created this study guide that has practice questions all about the different surfactant agents that you should know. You can use this guide as a review to boost your knowledge all about surfactant and more. So if you’re ready, let’s go ahead and dive right in. Surfactant alters the surface tension of the alveoli and the resulting pressures needed for alveolar inflation. It is a surface-active agent that reduces surface tension. 2. What are surfactant agents? They regulate the surface tension at gas-liquid interfaces. 3. What is Laplace’s Law? Physical principle describing and quantifying the relationship between the internal pressure of a drop or bubble, the amount of surface tension and the radius of the drop or bubble. 4. What are exogenous surfactants? They are administered to replace missing pulmonary surfactant in RDS of the newborn. Artificial Surfactant/not native to the patient. 5. What is surface tension? It is the force caused by the attraction between like molecules that occurs at liquid-gas interfaces and holds the liquid surface intact. 6. How does surface tension affect the lungs? The higher the surface tension of the liquid the greater is the compressing force inside the alveolus which can cause collapse or difficulty in opening the alveolus. 7. Would you give surfactant to a 36 week old gestational aged newborn that shows no signs of respiratory distress and has stable vitals? No, because the proper gestational term for surfactant is 24-29 weeks. 8. What are surface-active agents that lower surface tension? 9. What is another name for surface active agents? 10. What is the force caused by attraction between like molecules that occurs at liquid-gas interfaces and holds liquid surface intact? 11. What type of surfactant is clinically indicated for the treatment or prevention of RDS in the premature newborn? 12. Would recommending Poractant Alfa to a 28-week gestational aged newborn weighing 1000 grams that exhibits symptoms of RDS be a good move? Yes, because it is an exogenous surfactant agent used for newborns experiencing signs of RDS. 13. What is LaPlace’s law relating to an alveolus? Pressure = (2 x Surface tension)/Radius. 14. What typically results in a lack of surfactant in respiratory distress syndrome of the newborn? 15. What does the term Exogenous describe in regards to surfactant? Surfactant that is produced outside of the patients’ body. 16. What is surfactant primarily composed of? 17. What four surfactant agents are currently used for the treatment of neonatal RDS? Beractant (Survanta), Calfactant (Infasurf), Poractant alfa (Surfaxin), and Lucinactant (Surfaxin). 18. What is endogenous surfactant produced by? 19. Where is surfactant produced by type II alveolar cells stored? 20. What is the major stimulus for secretion of surfactant into the alveolus? Inflation of the lung via a chemically coupled stretch response. 21. What is the key feature of surfactant production? 22. What is a synthetic surfactant recently approved by the FDA for use in infants at risk for RDS? 23. What are the three approved indications for surfactant therapy? 24. What is the trade name for the generic exogenous surfactant preparation beractant? 25. What is the typical method for administering exogenous surfactant to infants? By direct instillation to the airway. 26. What are currently the two methods used for delivering surfactants into infants? Instillation through side-port adaptor and instillation through a catheter. 27. What is the trade name for the generic exogenous surfactant preparation calfactant? 28. What is the trade name for the generic exogenous surfactant preparation poractant alfa? 29. What is the trade name for the generic exogenous surfactant preparation lucinactant? 30. What is not a hazard or complication of exogenous surfactant? 31. With an infant who is currently on a pressure control ventilator, what two things must you keep a keen eye on? Increasing tidal volumes and decreasing PaCO2 (Hypocapnia). 32. What is the main mode of action for surfactant in neonatal with RDS? To replace and replenish missing endogenous surfactant pools. 33. What is the brand name and initial dose of Beractant? Brand Name: Survanta; Formulation: 4- and 8-mL vial, 25 mg Phospholipids/mL with 0.5 to 1.75 mg/mL triglycerides, 1.4 to 3.5 mg/L free fatty acids, and <1 mg/mL protein; and, dose: 100 mg phospholipids/kg (4mL/kg birth weight) in four divided doses by tracheal instillation. 34. What are two modified natural surfactants (bovine)? Beractant (Survanta) and Insfasurf (Calfactant). 35. What is the brand name and initial dose of Calfactant? Brand Name: Infasurf; Formulation: 3- and 6-mL vial, 35 mg phospholipids/mL, with 0.65 mg proteins; and, dose: 3 mL/kg in two divided doses of 1.5 mL/kg by tracheal instillation. 36. What is the brand name and initial dose of Poractant Alfa? Brand Name: Curosurf; Formulation: 1.5- mL vial, 80 mg phospholipids, with 1mg of proteins, or 3-mL of proteins, or 3-mL vial, 160 mg phospholipids, with 2 mg of proteins; and, dose: 2.5 mL/kg (200 mg/kg) in two divided doses by tracheal instillation. 37. What is the brand name and initial dose of Lucinactant? Brand Name: Surfaxin; Formulation: 8.5-mL vial, 30 mg phosphlipis, 4.05 mg of palmitic acid, and 0.862 sinapultide; and, dose: 5.8 mL/kg in four divided doses by tracheal instillation. 38. What kind of patients should an artificial surfactant be administered to replace missing pulmonary surfactant? Premature newborns with respiratory distress syndrome (RDS). 39. What does RDS in newborns come from? 40. Between what weeks of gestation is a newborn considered full term? 41. What week range can a baby be considered premature? 42. Between what weeks of gestation is surfactant usually made? 43. What is the role/job of surfactant? 44. Surface tension is a force caused by attraction between like molecules that occur at what interface? At a liquid/gas interface and holds liquid surface intact. 45. Laplace’s Law is defined as? The higher the surface tension, the more likely the alveolus will collapse. 46. What can high surface tension cause? The collapse of the alveoli or difficulty in opening the alveoli. 47. What needs to be overcome to get the alveoli open? 48. What does lowering the surface tension do? Make it easier to open the alveoli – easier to inflate. 49. What is endogenous surfactant? Real and made by the body. 50. Exogenous Surfactants are indicated for the treatment/prevention of? Respiratory Distress Syndrome in newborns. 51. What type of treatment is Prophylactic Treatment? 52. What type of patients can exogenous surfactant as a prophylactic preventative be given? As preventative in low birth weight infants, in infants with higher birth weight but who show signs of immature lungs and infants at risk of developing RDS. 53. What are the indications for the use of Exogenous Surfactant? In premature infants at risk for RDS and as a rescue agent for infants with RDS. 54. What type of patients need Exogenous Surfactant to be given as a rescue treatment? Rescue treatment for infants who have developed RDS. 55. High surface tension can lead to? Increased WOB, increased pressure, decreased volumes, and decreased compliance. 56. What can Surfactant do to the body? Lower surface tension, increase compliance, and decrease WOB. 57. What is Surfactant made up of? Lipids and proteins (almost identical to the body’s surfactant). 58. Where is Surfactant made? In type 2 alveolar cells. 59. Where is Surfactant stored? In lamellar bodies in type 2 cells. 60. What is the major stimulus for secretion of surfactant? The inflation of the lungs. 61. How is exogenous surfactant given to newborns? Placed as a liquid down the ET tube (Intratracheal). 62. How many doses of Exogenous Surfactant are usually needed before improvement is seen? 63. What must be done to the infant during Surfactant administration? The newborn is turned side to side to make sure the surfactant gets to all parts of the lungs. 64. What are the three naturally made/modified surfactant drugs (brand names)? 65. What is the drug name of the Synthetic Made Surfactant? 66. What three drugs are naturally made/modified surfactant drugs (drug names)? Beractant, Calfactant, and Poractant alfa. 67. Which Surfactant drugs work faster/better? The ones that are natural/come from animals. 68. What is the brand name of the synthetic-made/man-made Surfactant? 69. How are the surfactant drugs administered? 70. What is the brand name of Beractant? 71. What is the drug name for Survanta? 72. What is Beractant (Survanta), a modified natural surfactant, made from? 73. What is Beractant (Survanta) used for? Prophylactic therapy of newborns under 1250 grams or newborn with a risk of RDS and as a rescue treatment for infants with RDS. 74. What is a normal birth weight for an infant? 75. If Beractant (Survanta) is given for preventative treatment, it should be given in what time frame? 15 min of birth or ASAP. 76. If Beractant (Survanta) is given for rescue treatment, in what time frame should it be given? Within 8 hours of birth. 77. What is the dosage for Beractant (Survanta)? 4 mg/kg of birth weight in 4 dosing intervals (1/4 doses, quarter doses). 78. At what dosage rate is Beractant (Survanta) given? 79. What is Calfactant (Infasurf), a modified natural surfactant, made from? 80. What is the brand name of Calfactant? 81. What is Calfactant (Infasurf) used for? Preventative for infants at less than 29 weeks and rescue treatment who develop RDS at or before 72 hours of age. 82. If Calfactant (Infasurf) is given for preventative treatment, at what time should it be given? No more than 30 min after birth. 83. What is the dosage for Calfactant (Infasurf)? 3 ml/kg of birth weight delivered in two doses. 84. Calfactant (Infasurf) is given at an administration rate of? 85. What is the brand name of Poractant? 86. What is Poractant (Curosurf), a modified natural surfactant, made from? 87. What is Poractant (Curosurf) used for? Only used as RESCUE treatment for infants with RDS (has also been used for meconium aspiration and streptococcal infections of infants). 88. What is the dosage for Poractant (Curosurf)? 2.5 ml/kg of birth weight at two intervals – 1.25 ml/kg dose can be given if necessary after 12 hours. 89. Poractant (Curosurf)’s 2.5 ml/kg dose is given in how many parts? 90. Calfactant (Infasurf)’s 3 ml/kg dose is given in how many parts? 91. Beractant (Survanta)’s 4 mg/kg is given in how many parts? 92. What is the brand name for Lucinactant? 93. Lucinactant (Surfaxin) is what kind of surfactant? 94. Lucinactant (Surfaxin) can only be used how? As a preventative for infants at risk of RDS. 95. What is the dosing for Lucinactant (Surfaxin)? 5.8 ml/kg of body weight. 96. What should not be performed after administration of Surfactant? Suctioning for at least 1 hour. 97. What must be done to Surfactant drugs before it is administered? It must be warmed to room temp (except Infasurf). 98. After the administration of Surfactant, at what degree should the baby’s head be placed? 10 degree for 1-2 hours. 99. What is the mode of action for Surfactant? Replace/replenish endogenous (body made) surfactant and to be recycled into type 2 cells and form a surfactant pool for the infant. 100. What outcome do you usually see after the administration of Surfactant? A dramatic increase in oxygenation levels of the infant (you may also see an increased FRC and compliance). 101. What are the hazards/complications of Surfactant administration? Airway occlusion from fast/large medication delivery – desaturation – bradycardia, high PaO2 – need to lower FiO2 after surfactant administration (Retinopathy of Prematurity), overventilation/hypocarbia (low CO2) (alveoli open suddenly), apnea and pulmonary hemorrhage (most common). 102. What is the most common hazard/complication of surfactant administration? 103. What does Surfactant do to the life expectancy of premature infants? 104. A normal PaO2 for a newborn infant is? 105. In the future, what might surfactant therapy be used for? Meconium aspiration, reducing the severity of respiratory illness, ARDS in adults and aerosolization of surfactant (may work better). 106. What must be monitored during Surfactant therapy? Pulse/Cardiac rhythm, airway occlusion, color/activity level, better chest rise and PaO2, Sat to prevent hyperoxia and hypoxia. 107. What is a normal SaO2 level for an infant? So there you have it. I hope this study guide about surfactant was helpful for you. 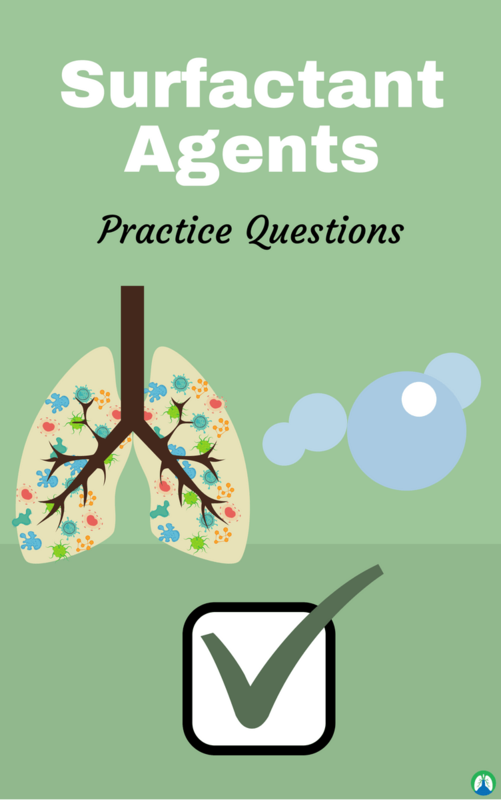 If you go through these practice questions multiple times, the information will stick and you will gain a good understanding about all the surfactant agents and more. Thank you so much for reading and as always, breathe easy my friend.